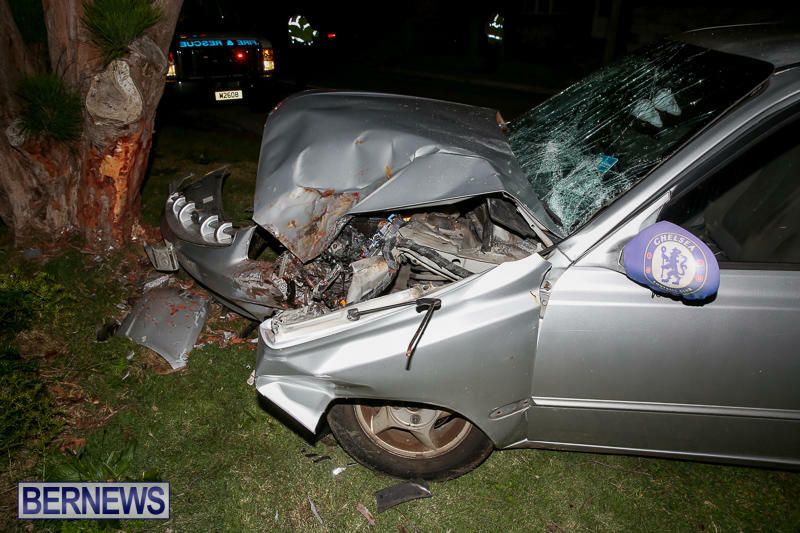 Emergency services responded to a collision in St George’s at approximately 1.30am this morning [Feb 18] involving a car crashing into a tree. 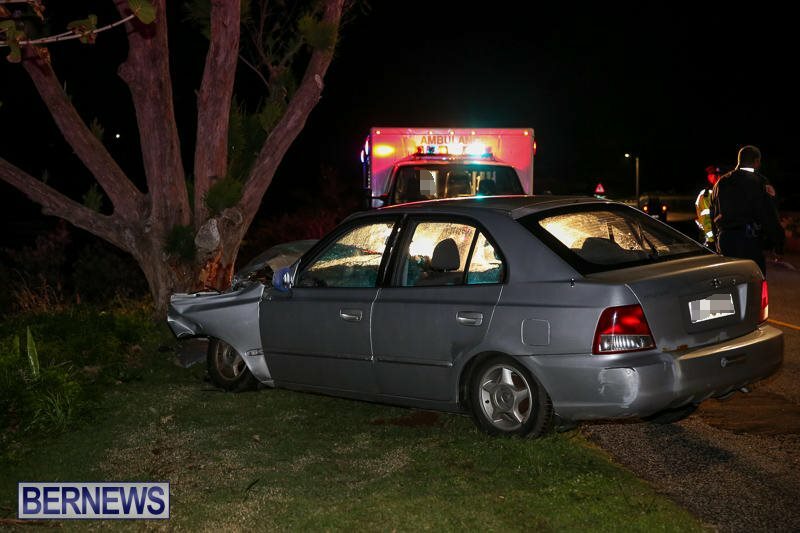 Bermuda Fire and Rescue Service personnel tended to the injured driver before he was transported by ambulance to King Edward Memorial Hospital for treatment. 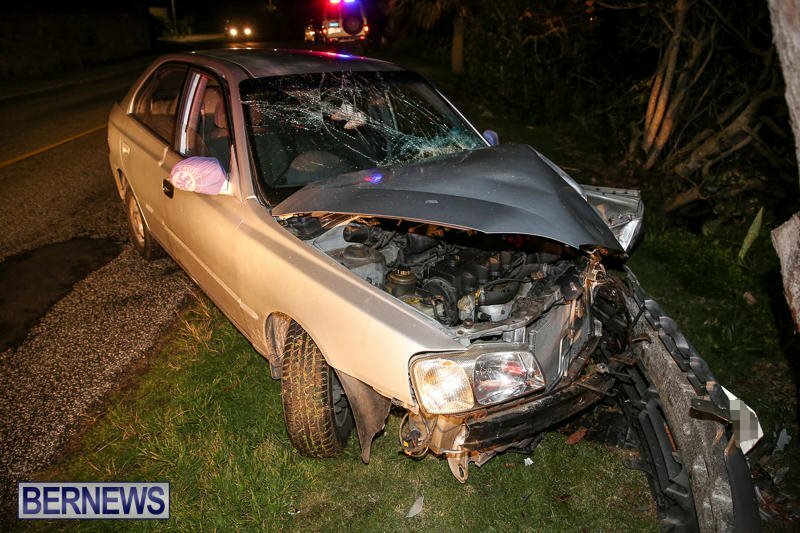 Police remained on the scene until a tow truck could attend and remove the vehicle. Details are limited at this time, however we will update as able. High Speed Trees in Bermuda again. Before I hear the usual nonsense of those that will try and make excuses how this happened and hoping the driver is oK etc…. To push an engine off it mounts and drive it backwards bringing the attached front wheels with it, traveling at a high speed had to be the reason! The object the car hit was NOT moving! We all pay for this behavior through higher insurance premiums, and I personally am sick of paying higher rates than I should be, because of it! Good observation/s on your part Kangy. I also noticed the severe accumulation of brake dust on the front brakes which is also a very bad sign. nice detective work Mr (i am always right because i know everything because i am perfect)Kangoocar. 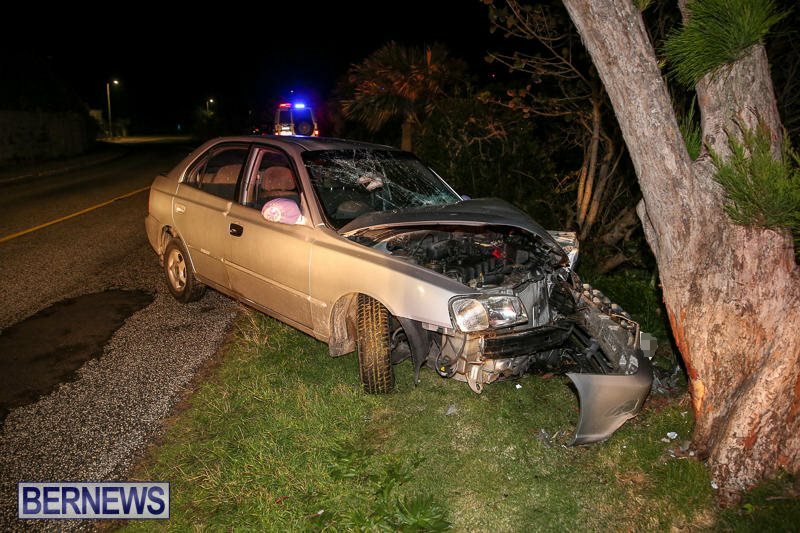 Agreed, there is some appalling driving in Bermuda, but to hope the driver is ok is not a nonsense statement. I believe Jesus did take the wheel or the headline would be more about it being a fatality and less about sounding like there was a date with destiny between the driver and the tree. Perhaps we can get a witness statement from Jesus. Agree I’m sick of paying for idiots, and until we make the laws stricter we will continue. For a lot of our insurance scales we use a Canadian table, so why can’t we enforce our driving laws as they do!